Today I am bringing you my friend Kaydee with The Sweet Life. 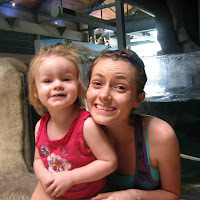 She is a pretty awesome momma who is not only a full time worker but a mommy, student and is currently planning her wedding, and not just any wedding, she is DIY and is hand making the majority of her decorations. I really cannot wait to see how it turns out. Today she is sharing with us her pony bead sun catchers that she made with her daughter that are super awesome. After you get done reading her tutorial on how to make your own, don't forget to follow her blog so you can see the final wedding pictures, I have seen some of the sneak peaks already and you won't be disappointed! We recently did a backyard overhaul. After living in apartments and rental houses, it was nice to actually have a backyard we could do something to. Lately I have been trying to add more decorative elements, but have had a hard time finding something that my 18 month old daughter, Rowen, could help with. I came across this project multiple times, from multiple blogs on Pinterest. It is so simple and my toddler loved it! Some sort of baking sheet: I used pizza pans. You could even use cupcake pans. First you need to pre-heat your oven to 400 degrees F.
Then simply arrange your beads on the pizza pan. If you are working with young children, constant adult supervision is required. You don’t want anyone choking on beads. When I arranged the beads, I left a small space to put my string through. If you don’t want to do this, all you have to do is drill a small hole with a hand held drill. 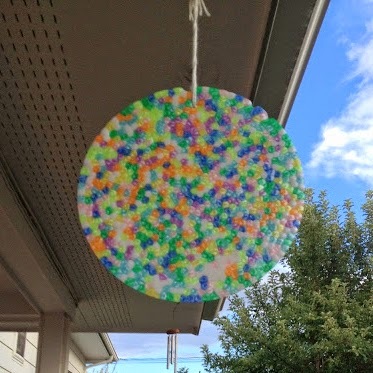 String up your sun catcher, and hang it where it will catch a lot of sun! One thing I would do differently would be to use transparent beads instead of solid. It still turned out great, but the transparent beads would allow it to catch more light. At 23 years old, Kaydee holds many titles; mother, student, employee, are just a few. She spends her days working in a physical therapist office as a tech and dreams of becoming a therapist one day. She spends another good chunk of her time attending classes and working towards her dream career. She loves crafts of all types, and is currently DIYing everything for her upcoming wedding. The rest of her time is devoted to her family. She has an 18-month old daughter who is your typical rambunctious toddler. Although she doesn’t have much free time, she loves blogging. You can find her blog, The Sweet Life here.